Born: 25th September 1887, Shelfanger, Norfolk. Baptised: 9th September 1889, at All Saint’s Church, Shelfanger, Norfolk – parents: Alice & Robert Henry Cobb, a Man Servant. Address: Shelfanger. During the same Baptism service Robert’s paternal cousin was also baptised – Bertha Spa Cobb, born 16th January 1888 – her parents: Sarah Ann & Weston Chilvers Cobb, a Carpenter. Died: 26th June 1915; age: 28; at Ipswich Isolation Hospital – Tuberculosis of Lungs. Served 10 years & 241 days. Residence: 25, Victoria Street, Ipswich. Employed: from January 1910, with the Great Eastern Railways, at Ipswich, as a Permanent Way Labourer. Enlistment Details: Location: Colchester, Essex; Date: 17th October 1904; Age: 18 years & 10 months; Occupation: Painter; Religion: CofE. Height: 5ft 6 1/4ins, fresh complexion, hazel eyes & brown hair. Tattoo: E.M. left forearm. Robert was a reservist in the York & Lancaster Regiment and was called to the Colours at the outbreak of war. Date of Entry Therein: 9th September 1914. Service: Home – 17th October 1904 – 7th December 1905 – India – 18th December 1905 – 25th October 1907 – Home – October 1907 – 30th October 1907 – Reserves 31st October 1907 – 4th August 1914 – Home – 5th August 1914 – 7th September 1914 – France – 8th September 1914 – 10th December 1914 – Home – 11th December 1914 – 14th June 1915. Invalided home: 11th December 1914. Discharged: 14th June 1915 – Hylton Castle, Sunderland – Totally Incapacity – due to active service and exposure in tunnels causing chills followed by Acute Bronchitis and Tuberculosis of Lungs. Rank: Private; Service Number: 7993. Regiment: York & Lancaster Regiment, 3rd Battalion. 1891 Chandler Hill, Shelfanger, Norfolk. 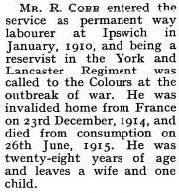 Robert Harry Cobb, 25, a General Labourer, born Shelfanger. Annie Cobb, 27, born Thursden, Norfolk. Alice Harriet Leah Cobb, 5, born Ipswich. Lilie Elizabeth Cobb, 2, born Shelfanger. 1901 37, Barack Street, Colchester, Essex. Robert was 14 years old, an Errand Boy. He was living with his father, siblings, step mother & step brothers. Louisa Martha Cobb, 26, born Ipswich. Alice, 15, a General Domestic Servant. John Henry Cobb, 9, born Farnsfield, Norfolk. Charles Stempson Edgar Cobb, 1, born Ipswich. Raymond Herbert B. Paull Cobb, 5 months, born Colchester, Essex. Robert’s mother, Annie Cobb, died 1896, Tendring, Essex. George Henry Cobb, born 20th October 1915, Ipswich. Robert is also remembered on the Great Eastern Railway war memorial, Liverpool Street Station, London.